An anagram for "Michael Dean" is "Deal Machine," and that truly fits. Dean never sits on his laurels, and he's constantly touching the world in special places. Michael is the author of the books $30 Film School, $30 Music School, $30 Writing School, Starving in the Company of Beautiful Women, The Simple Pleasures of a Complex Girl, and DIY NOW! Digital Audio. He directed the films D.I.Y. Or Die: How To Survive as an Independent Artist and Hubert Selby Jr: It'll Be Better Tomorrow. Michael played guitar in the band The Beef People. He sang and played bass in Baby Opaque and Bomb (Warner Brothers). Michael W. Dean has toured America and Europe lecturing at youth centers, colleges, and museums. He was a speaker at the Podcast and New Media Expo. Michael contributed to O'Reilly's Digital Video Hacks book, edited O'Reilly's DV Filmmaking: From Start to Finish by Ian Aronson, and wrote "MAKE a Mailbox Movie" in MAKE Volume 3. His books $30 Film School, $30 Music School, and $30 Writing School have sold over 100,000 copies. He co-authored (with Alan Lastufka) a book for O'Reilly called YouTube: An Insider's Guide to Climbing the Charts. Michael directed the film, "Guns and Weed: the Road to Freedom". 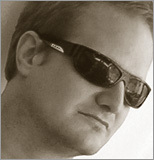 Michael created the BipCot NoGov license for software, media, services and events. Michael co-created FeenPhone, a free VoIP program for radio hosts and podcasters that sounds better than Skype. Michael does a libertarian radio show called The Freedom Feens, syndicated nationally on Genesis Communications Network. Michael sleeps in late, stays up late, and works at home as a writer and filmmaker. He lives in Casper, Wyoming with his nifty wife DJ and their two cats, BipCat and BEAST. Michael loves communicating out to the world, but says, "A good day is one where my phone doesn't ring." "The book's candid, colloquial tone, paired with plentiful screen-shot visual aids, gives it an informal, insider's feel...In short, Dean and Lastufka take a complex maze of information and make it user friendly in this behind-the-scenes, how-to guide on creating and promoting your videos for YouTube. Whether you are just looking for some useful tips on YouTube self-promotion, you should get something out of YouTube: An Insider's Guide to Climbing the Charts." "Want to make a hit on YouTube? Then it's key to acquire this title, written by two veteran 'Tubers' who have numerous subscribers to their name and show how to make quality videos, optimize and promote them, and how to create personal channels and successful displays that gain devote audiences. " "Bottom line, this is an excellent book. The material is solid and comprehensive, and they back up everything they say with actual URL examples from YouTube. Again, if you are going to post on a semi-regular basis on YouTube, this is a must-read." "This book is simple and easy to follow, and it will even teach you about the critical criteria of a good video." "I'm happy for a few reasons. One, the book is really useful. Two, both authors dropped me a line pretty much the day I posted my review, meaning that they're really plugged into the blogging world (which makes me happy, and I don't care if that's a selfish feeling, but hey, if you're blogger-friendly, I'm more likely to like you back). Three, the book is really useful." "So if you want to be a YouTube star, this book is required reading. " "...simply brilliant...I can honestly say i am reading this cover to cover, and this will most probably be one of the best non-fiction books i have ever brought, and i am sure this will most definitely help and guide me to making better good videos for YouTube, and may just help me to create awesome videos for FiveAwesomeWebGeeks." "Alan and Michael understand viral marketing  and they know what it takes to get your work on everyone's YouTube radar. And, once you read this book, so will you." "I found a lot to like in this book. It would best be used by someone under 35 who isn't trying to be "conventional" in their marketing approach. A good and honest introduction in how to use YouTube to get the word out." "No one knows more about building a fan base than YouTube star Alan Lastufka. Alan and his co-author, the well-known independent filmmaker Michael W. Dean, will show you a variety of effective strategies for becoming more popular. Proceed into the wisdom of this book, and I look forward to seeing you pass me on the YouTube most subscribed list."